In every household, this huge battle blows up right before selecting the wedding videographer. The parents want a traditional one where each minuscule detail of the wedding will be recorded (just like theirs!) vs. the bride & groom who usually want a wedding film videographer. So let’s get to understanding what the basic difference between the two is! As one of the leading wedding photographers in Dubai, I can tell you that a wedding film is your go-to option if you love a little story in your wedding. It’s simply a storytelling wedding film. Whether the storyteller tells your story through video only or the mix of speeches, images, and music, is your call. The film is shot in a same manner as traditional but expect your videographer and candid photographer to be everywhere. Literally even in your closet! It’s because we are shooting to tell your story, not just document every single minute of your wedding day. So that includes shooting your jewellery and clothes, get candid shots of you with your bridesmaids or groomsmen as you get ready or even as you are wearing your wedding shoes! Wedding films also include a huge amount of editing after its shot. Traditional videography for weddings is your typical video camera that is usually shot continuously. There’s not much creativity involved besides following the couple around and documenting everything that’s being done. So don’t expect a slow-motion capture of your garland exchange or a candid shot of your grandma crying at your wedding. There’s no storytelling involved or editing of any format. It’s pretty much a point & shoot type of thing and it’s much cheaper of the two! I usually ask couples to first finalise a few things before they decide to take a call. Both the offerings have their pros and cons. You need to understand what you and your wedding require. The few things that you must decide are the budget, the type of film you are looking at, involvement and finally what is the objective. A wedding film requires a lot of involvement as it includes interviewing your friends and family, you selecting the music to go in the video (a wedding photographer in Dubai told me that the delay in the delivery was because the bride kept changing the song for 3 months!) and also you narrating your story! This couple (http://vivekkrishnan.com/wedding-film/ – Deepika and Suhas) told us even about their breakup in their wedding film which actually told us about the depth in their relationship! It’s emotional, it’s sharing your day with people in the most raw and stunning way. So be prepared for this plus all of your heart-warming moments in the wedding. Traditional videography, on the other hand requires zero involvement from your end. Its shot from start to end and it’s all the videographer’s work. If you are a couple that aren’t very comfortable about talking about your love story, don’t believe spending a lot or doing crazy things in front of a camera (hey, no judgement here! ), it’s the best option for you’ll as all you will have to do is – get married! I believe that you should decide what they want because it’s your day. Make time for all the research possible before you take the final call. 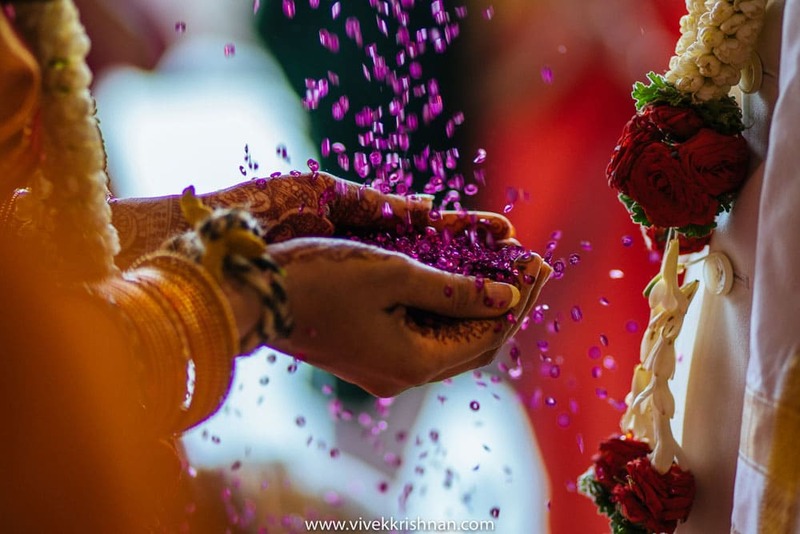 Even if you are having a destination wedding in Dubai or Jaipur, talk to multiple wedding photographers in Dubai and Jaipur to understand and tell them what you wish for. After all it’s your big day and memories are all you can take away!